In the morning trade on Monday, it was observed that ICICI Bank, Maruti Suzuki, State Bank of India and Infosys are among the most active stocks in terms of value on NSE. There are several other most active stocks in terms of value on NSE. Some of them are Tata Motors with the value of Rs 104.24 crore and Reliance Industries with the value of Rs 99.09 crore. Among the list, Titan Company, HDFC Bank, Kotak Mahindra Bank, Axis Bank, Tata Steel and Ashok Leyland are included. On 2nd April, Today is also the first trading day of the new financial year 2018-19. 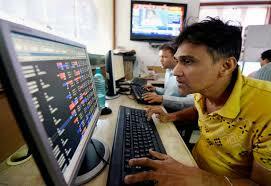 Sensex went over 100 points to 33,000 level amid positive global cues. If you are the one, who has just started intraday trading or share market trading and looking forward to an understanding of some technical strategies then you have reached the right post of the internet. In this post, you will also learn the implementation of Triangular Moving Average in order to generate accurate intraday tips by knowing the average price over a certain number of data points.